That didn’t take long. 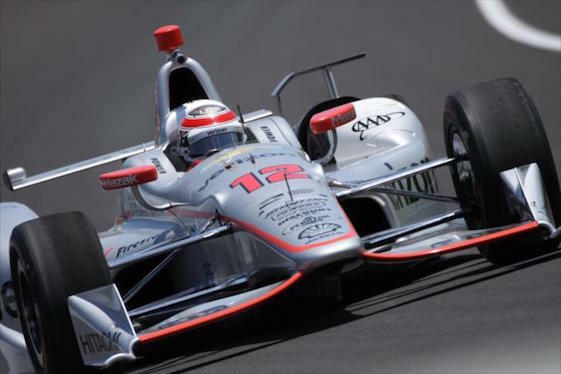 One day after Marco Andretti of Andretti Autosport paced opening practice for the 101st running of the Indianapolis 500, Team Penske returned to familiar territory atop the speed chart. Will Power and Helio Castroneves of team-owner Roger Penske’s juggernaut stood 1-2 at the close of Tuesday’s six-hour session, followed by Gabby Chaves with fledgling Harding Racing. Verizon IndyCar Series drivers logged more than 6,000 incident-free miles around the 2.5-mile Indianapolis Motor Speedway in preparation for qualifying this weekend and “The Greatest Spectacle in Racing” on May 28. Power, winner of Saturday’s INDYCAR Grand Prix on the IMS road-course, topped the time sheet with a mid-afternoon lap of 40.0613-seconds/224.656 mph on the 47th of his 71 total laps. Power’s best finish in nine previous Indianapolis 500s was second in 2015. The 36-year-old Australian is looking to present Penske_ aka “The Captain” _ his record-extending 17th Indy 500 victory. “Roger definitely just puts everything into this race,” said Power, driver of the No. 12 Verizon Team Penske Chevrolet and the 2014 series champion. “As a team, I think we did a lot of homework in the offseason for this race and we tested here twice, so you know we’re getting the most out of our package. I know Chevy is working really hard and obviously you can see that our speeds are pretty good right now. Castroneves jumped into second during the hectic final hour of practice that featured large groups of cars running together, posting a lap of 224.287 mph in the No. 3 Team Penske Chevrolet. 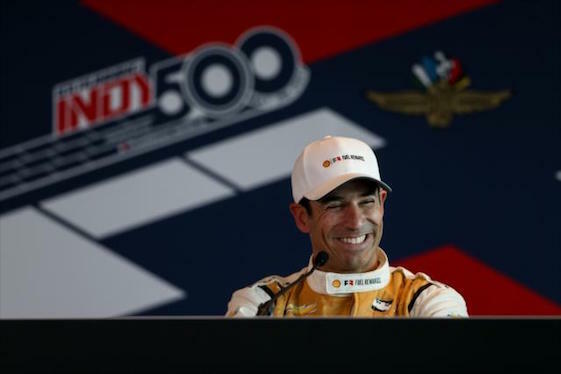 A three-time Indy 500 champion, Castroneves noted that Penske _ who serves as his race day strategist _ is spending the week at IMS instead of attending to his myriad racing/business interests. Helio Castroneves, chasing a fourth Indy 500 victory, was second fastest to Team Penske teammate Will Power in Tueday’s practice. Andretti recorded the fastest speed during Monday’s opening practice, lapping in 39.7636-seconds/226.338 mph in the No. 27 United Fiber & Data Honda. Thirty-two cars turned 1,306 laps around the Speedway Monday. It marked the second straight year that Andretti, grandson of 1969 Indy 500 champion Mario Andretti, has been fastest on the first day of Indy 500 practice. Chaves, a native of Colombia who has competed in the last two Indy 500s, turned a top lap of 223.991 mph among his 87 in the No. 88 Harding Racing Chevrolet after being limited to just six laps on Monday. “We did, I think, three laps on-track and then three more out-and-in (Monday), and that wasn’t good,” said Chaves, the 2014 Indy Lights champion who competed in seven Verizon IndyCar Series events for Dale Coyne Racing in 2016. “Obviously, our guys were disappointed that we didn’t really do any laps. Today (we) had to kind of bounce back from that and right away work on the car and improve it and show some speed. 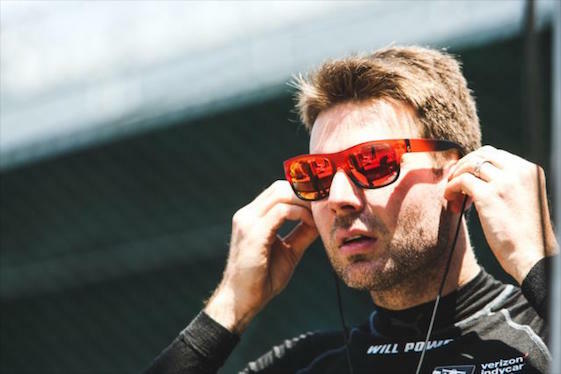 Will Power gets set to climb into the cockpit on Tuesday. 32 drivers to turn 2,404 laps, nearly 1,100 more than on Monday. Rookies Zach Veach (No. 40 Indy Women in Tech Championship Chevrolet) and Jack Harvey (No. 50 Michael Shank Racing with Andretti Autosport Honda) completed their Rookie Orientation Program requirements and were cleared for full competition the rest of the Month of May. They join Ed Jones and two-time Formula One World Driving Champion Fernando Alonso of Spain as first-timers in the field. Alonso ran the most laps of anyone (117) Tuesday as he worked to become comfortable in traffic. The driver of the No. 29 McLaren-Honda-Andretti Honda finished 24th on the speed chart with a top lap of 221.029 mph. “It felt OK, it felt as I expected,” Alonso said. “Obviously, here it’s very important to keep close to the car in front of you, to take the benefit from the next straight. It was useful. I’m on the best team for that; we are six cars and we were running together. Practice is scheduled to continue Wednesday through Friday from noon-6 p.m. (ET) daily. A live video stream of practice is available at RaceControl.IndyCar.com. Two days of qualifying to determine the 33-car starting grid will take place this weekend. Coverage Saturday airs from 11 a.m.-3 p.m. (ET) on ESPN3 and 4-6 p.m. on ABC. Sunday’s qualifying to determine pole position airs from 2:30-4 p.m. (ET) on ESPN3 and 4-6 p.m. on ABC. The 200-lap Indianapolis 500, sixth race of the 2017 Verizon IndyCar Series season, will air live at 11 a.m. May 28 on ABC and the Advance Auto Parts INDYCAR Radio Network. Veteran aerodynamicst Andy Brown has signed with A.J. Foyt Racing as engineer of rookie Zach Veach’s No. 40 Indy Women in Tech Chevrolet for this month’s Indy 500. Andy Brown has joined A.J. Foyt Racing. experience to a Foyt team which also is fielding ABC Supply Chevrolets for Carlos Munoz (No. 14) and Conor Daly (No. 4) in the 500. Team-owner A.J. Foyt Jr. is the first four-time winner of the Indy 500. 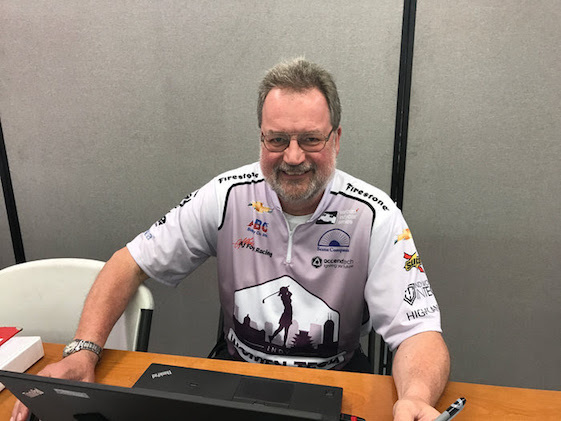 Although Brown’s primary responsibility will be working with the 22-year-old Veach, Larry Foyt believes Brown’s expertise in aerodynamics will benefit the entire team. Andy O’Gara will oversee the team as crew chief/race strategist. This is O’Gara’s second year in that role, having worked as Alex Tagliani’s strategist when the Canadian drove the No. 35 Alfe Heat Treating car last May. O’Gara is the son of John O’Gara, who worked as a mechanic for Foyt’s team when A.J. was driving in the late 1980s and early ‘90s. Prior to forming his company, Brown worked at Chip Ganassi Racing as lead race engineer with the late Dan Wheldon in 2006-2007 and as the team’s aerodynamicist (2005-2010). During that time, the team won 34 races and two Indy 500s (2008 with Scott Dixon and 2010 with Dario Franchitti). Brown spent seven years as chief engineer and race engineer at Panther Racing (1998 – 2005), a period which yielded 15 wins and two Indy Racing League titles (2001-2002) with Sam Hornish Jr., who won 11 races. Brown’s five years at PacWest Racing (1993 – 1998) saw him build a team from scratch along with the late John Anderson. Brown began his career with Robin Herd’s March Engineering in 1984 as a project engineer in Formula 3000. It was at March that Brown met Phillips, as both engineers were starting their motorsports careers. When the company transitioned into Leyton House Formula 1, Brown was a race and design engineer. That led to a season as chief race and test engineer for the Brabham Yamaha Formula 1 team in 1991. The following season he became the assistant technical director and head of aerodynamics for Galmer Engineering, which fielded the Galmer IndyCar driven by Al Unser Jr. to victory in the 1992 Indianapolis 500. It was the first of four Indy 500 victories for cars engineered by Brown.